Do you know what we love? Books is a good answer. Old books is an even better answer. Old books with pretty illustrations the best answer (or at least, the best answer considering we don't want to be here all night). 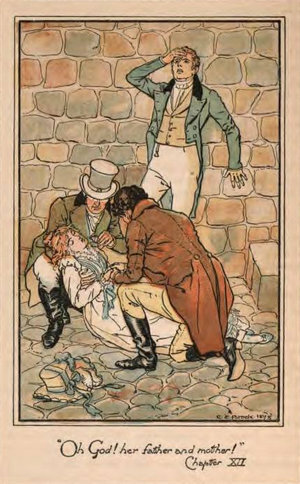 So I was pretty excited to come across a 1898 edition of Persuasion containing some lovely illustrations by C.E. Brock (who was apparently a well-known Victorian illustrator; thank you, Google, for that piece of information!). You can see all six of these vintage illustrations below, together with their context in the book. Our favorite thing about illustrations is seeing how the artist envisioned the characters and how closely his sketches match the pictures we had in our minds. 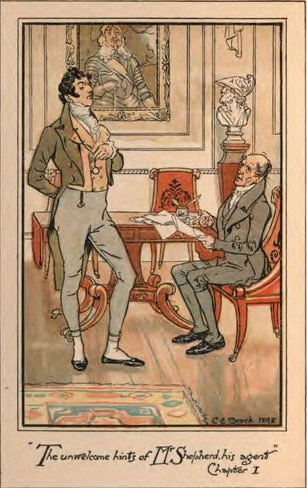 It is also the main reason some people dislike illustrations *cough* Charles Lamb *cough*. What do you make of Brock's depictions though? We have to admit, we're not quite sold on his Captain Wentworth, but what do you think of Anne and the other characters? Her father was growing distressed for money. She knew, that when he now took up the Baronetage, it was to drive the heavy bills of his tradespeople, and the unwelcome hints of Mr Shepherd, his agent, from his thoughts. The girls were wild for dancing; and the evenings ended, occasionally, in an unpremeditated little ball. There was a family of cousins within a walk of Uppercross, in less affluent circumstances, who depended on the Musgroves for all their pleasures: they would come at any time, and help play at any thing, or dance any where; and Anne, very much preferring the office of musician to a more active post, played country dances to them by the hour together: a kindness which always recommended her musical powers to the notice of Mr. and Mrs. Musgrove more than any thing else, and often drew this compliment -- "Well done, Miss Anne! very well done indeed! Lord bless me! how those little fingers of yours fly about!" Anne, really tired herself, was glad to sit down; and she very soon heard Captain Wentworth and Louisa in the hedge-row, behind her, as if making their way back, along the rough, wild sort of channel, down the centre. 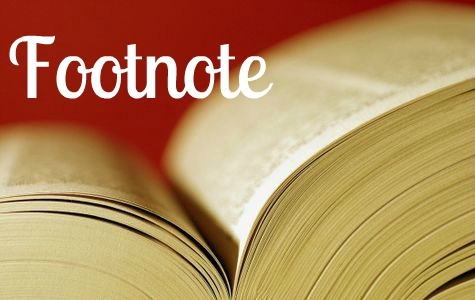 She had only time, however, to move closer to the table where he had been writing, when footsteps were heard returning; the door opened, it was himself. 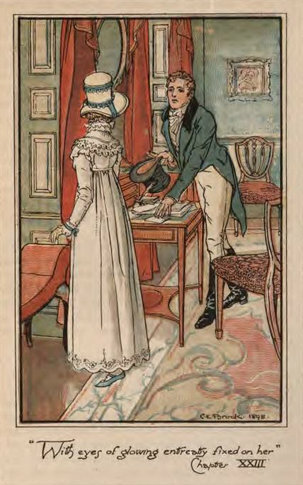 He begged their pardon, but he had forgotten his gloves, and instantly crossing the room to the writing-table, and standing with his back towards Mrs. Musgrove, he drew out a letter from under the scattered paper, placed it before Anne with eyes of glowing entreaty fixed on her for a time, and hastily collecting his gloves, was again out of the room, almost before Mrs. Musgrove was aware of his being in it: the work of an instant! Only borrowed this picture to show you the difference. See more here. Overall, we like the watercolors better. They seem less detailed when it comes to the surroundings, but much more focused on the characters. We strongly encourage you to go take a look at them too and tell us what you think. 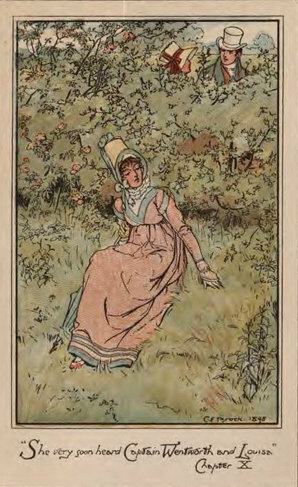 And if you feel like reading a very interesting and thorough article on Jane Austen's illustrators, here's the place to go to. Wow, that Captain Wentworth looks nothing like the image I have in my mind. I always picture him much older and a touch more sober and thoughtful. This one looks like a dandy! Lovely to have an idea of what other readers were given as eye-candy all that time ago though. Ha, great point! I love it. 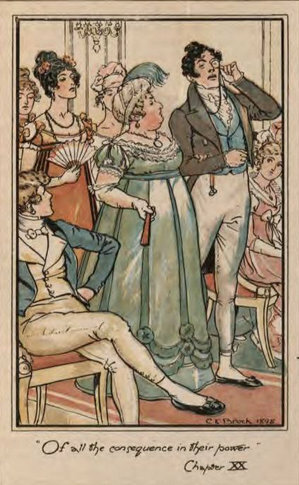 Regency England definitely seemed like quite the dandified era. Love the pictures! 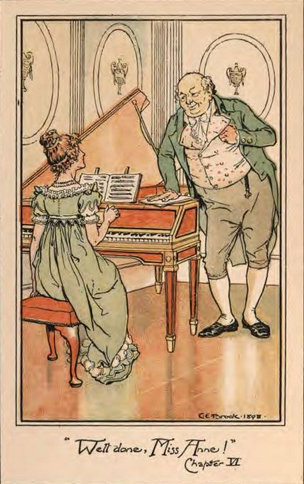 I'm reading the 1952 Oxford Illustrated edition of Dickens' Our Mutual Friend and the pictures really are adding to my ejoyment. Oh cool! We love old illustrations around here--they definitely make a good book even more enjoyable. I'm fascinated by some of those hairstyles! 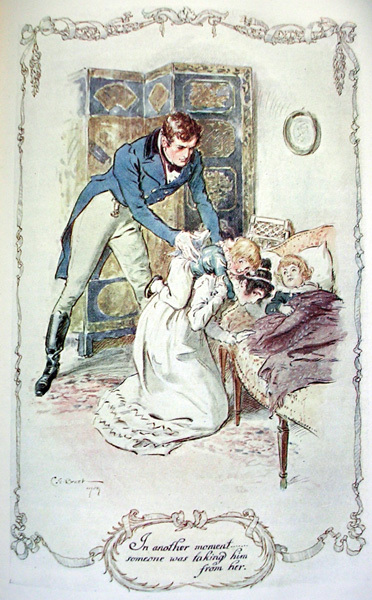 It really makes a difference when you're looking at pictures made by an artist who lived pretty close to Austen's era. Makes it all look pretty authentic, I think. As for Wentworth...he looks extremely young...and Anne looks like she's suffering from a lot of physical pain. The last picture of Wentworth looks extremely dashing! I see that guy more as a Heyer hero than an Austen one. Yes, I love looking at old hairstyles! It's so crazy to see what elaborate hairstyles women wore. I can't imagine having to wear my hair up everyday like that.